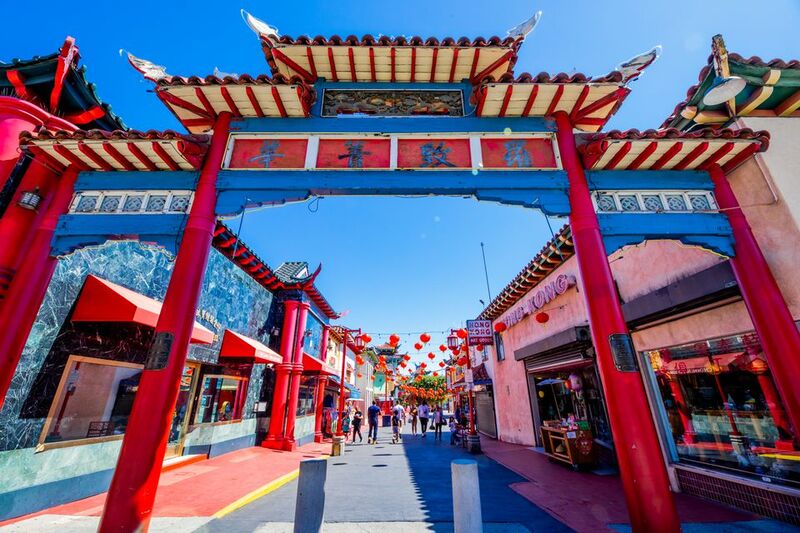 Los Angeles Chinatown is located just north of the Music Center, City Hall, El Pueblo de Los Angeles at Olvera Street and Union Station, so it's easy to fit in a visit while seeing other Downtown Los Angeles attractions. You won't find the density of humanity moving along the sidewalks that you would see in the Chinatowns of New York, San Francisco or Toronto. LA's Chinatown has a much more laid-back vibe. Chinatown encompasses less than a square mile bordered by Main Street to the East, Yale Street to the west, Cesar Chavez to the south and Bernard Street to the north. Also known as New Chinatown, the current neighborhood was relocated in 1938 from a few blocks east where the original LA Chinatown was razed to make way for Union Station. The only remaining building from the original Chinatown is the Garnier Building, now located within El Pueblo de Los Angeles Historic Site, which is home to the Chinese American Museum. It's about a block southeast of the border of New Chinatown, which begins just across from Union Station and El Pueblo. You might want to stop at the museum to learn more about the history of the Chinese in Los Angeles. Landmarks in Chinatown are marked with interpretive panels on pillars as part of the Angels Walk self-guided walking tour. Some of the stops on the walking tour are touristy, like "Old Chinatown" Central Plaza and others are more historic, like the 2nd oldest school in LA and the French hospital. The Angels Walk Tour starts at the Chinatown Metro Station. My tour starts at the new Gateway and doesn't include the outlying non-Chinatown detours in the Angels Walk Tour. The Chinatown Gateway to Los Angeles Chinatown, also known as the Dragon Gate, is located on Broadway, just north of Cesar Chavez. Designed by artist Ruppert Mok, it's a relatively new addition to Chinatown, dedicated in 2001. Nighttime lighting was added in 2004 so you can get your nighttime selfies with the gate too. If you're entering this way, the shops don't start until half-way up the block on Broadway. You'll find Chinese herb shops, markets, and souvenirs. There are commercial buildings, apartments, and parking lots between sections of shops as you head north. You can drive through the gate, or walk north from the Civic Center/Grand Park Metro Station. It's also just a few blocks west of Union Station Metro stop along Cesar Chavez. If you walk through, turn around and look south through the gate and it frames City Hall . Head north on Broadway (toward the mountains). On the left side of the street just north of College Street, the Plum Tree Inn Restaurant has three different tile murals by unknown artists. According to the Angels Walk Guide, the subtle "Picture of Viewing Waterfalls in Summer Mountains" is styled after a Song Dynasty (960-1279) brush-and-ink landscape painting. The center panel, "Palace in Heaven" is of a scene from the 14th Century Chinese tale "Journey to the West.The third panel, in a South Chinese style, is called "Four Beauties Catching Swimming Fish." Thinking of eating here? Check out the reviews on Yelp. Central Plaza was the first part of "New Chinatown" to be constructed and dedicated in 1938. 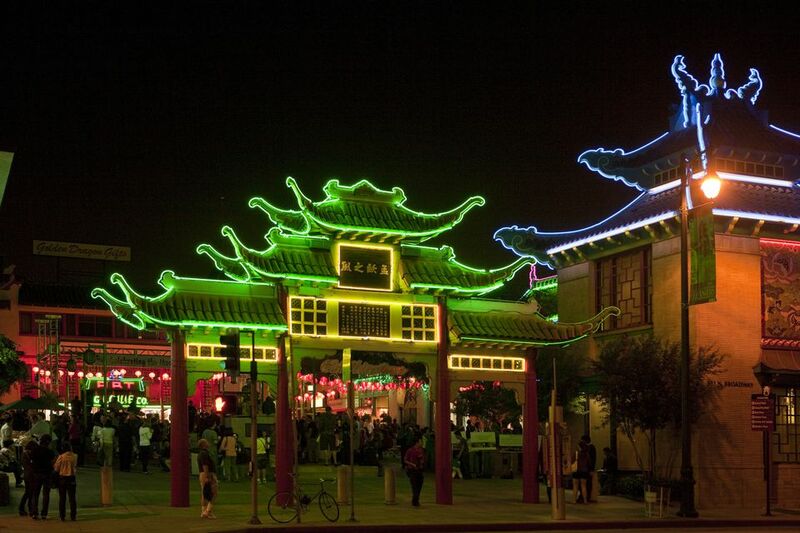 It is the only planned Chinatown in the US, a mix of retail and housing. This heart of New Chinatown is officially called Central Plaza but has also become known as "Old Chinatown," being the oldest and quaintest part of New Chinatown. The East Gate is the Grand Entrance, known as the Gate of Maternal Virtues, it was commissioned by attorney You Chung Hong in honor of his mother's memory. It is picturesque during the day but really comes into its own at night, like the rest of Central Plaza. To the right of the gate is a tower with a painting of a dragon by Chinese-American artist Tyrus Wong. Just inside the gate is a statue of Dr. Sun Yat-sen, Chinese revolutionary, first provisional president and ideological father of the Republic of China and another more recent statue of Bruce Lee. The buildings inside Central Plaza, with their characteristic sloped roofs, carved wood ornaments, and colorful facades, were inspired by the Hollywood version of Shanghai and designed by non-Chinese architects Erle Webster and Adrian Wilson. It was a precursor to themed shopping areas like Universal CityWalk and Downtown Disney. These adorable formal children's outfits at a shop in Central Plaza can be seen on hundreds of kids at Chinatown celebrations like Chinese New Year. At the far side of Central Plaza is the Wishing Well, where you can toss your coins into the fountain to wish for specific things like love, health or wealth. Interestingly, the signs get switched around all the time, so the god of wealth today may be sporting the health sign next week. Exit Central Plaza via the West Gate on Hill Street. The West Gate, with its neon Chinatown sign, was the first gate built around the Central Plaza. the inscription at the top of the gate reads "Cooperate to Achieve" in Chinese characters. The neon-covered West Gate is even more spectacular lit up at night, color coordinated with all the red lanterns. Across Hill Street from Central Plaza is West Plaza and a tiny alleyway called Chung King Row. West Plaza was built about five years after Chinese were granted the right to become citizens and own property in 1943. The ground-level shops all have living quarters upstairs, creating more of a community. These Angels Walk interpretive panels can be found all over Los Angeles Chinatown, giving you an overview of the historic significance of different sites. The businesses around West Plaza are kind of drab and not very photogenic compared to the ones across the street at Central Plaza, with the exception of this colorful building, home to the Fifth Floor Gallery. The Fifth Floor Gallery is one of a couple dozen galleries that started moving to the neighborhood in the late 1990s and 2000s, mostly concentrated around West Plaza and the little pedestrian alley behind it called Chung King Road. There's not a lot going on there during the day, but during art opening nights, the area is hopping. Check for gallery openings at www.chinatownla.com. For more information, visit www.ckroad.com or www.facebook.com/ChungKingRoad. You might find Fong's open during the day on Chung King Road, a little shop with a mix of antiques, gifts and exquisite miniatures. This Chinatown sign with its pole ornament is in front of Full House Seafood Restaurant at 963 Hill Street Hill Street. Castelar Elementary School is one of the stops on the Angels Walk tour of Chinatown. It's on the south side of College Street. This mural on the side of the school is by artist Shi Yan Zhang. It's called "The Party at Lan-Ting." It depicts famous Chinese calligrapher Wang Xi Zhi (321-376, Jin Dynasty) hosting a party where he wrote the preface to a poetry collection that became a model for centuries of Chinese calligraphers. According to the artist's interpretation, there were a lot of other things going on at this party while Wang Xi Zhi was writing. I'm showing the whole mural here, but the details make for more interesting photos. Castelar Elementary School was founded in 1882 and is the second oldest school in the Los Angeles Unified School District. It was originally a one-room schoolhouse, which burned down and was replaced by a 2-story building, which was again expanded in 1923. The wood-framed building didn't survive the 1971 Sylmar Earthquake. The current 33-room school opened in 1977. The students at the school have evolved from Spanish settlers to the children of French and Italian immigrants when this area was LA's Little Italy, followed by Serbians, Yugoslavians and Croatians. The Chinese student population grew in the 20s and 30s as Chinatown moved west. Castelar was the first school in the LAUSD with a Chinese American principal. Take the first left at Yale Street. Thien Hau Temple in Chinatown is a Taoist temple run by a Vietnamese refugee association. It is a recent addition to Chinatown. The temple first moved to the site in the 1990s into a former church while it built the new building, officially dedicated in 2006. The temple welcomes tourists to visit. Thien Hau Temple is dedicated to Mazu (or Matsu), the Taoist goddess of the sea, pictured on the right of this photo. She is the patron of sailors, fishermen and everything associated with the sea. There are also shrines to Guan Yu, the god of war, brotherhood and righteousness; Fu De, the popular god of earth, wealth and merit, and for good measure, the Buddhist bodhisattva, Dizang. The temple is run by the Camau Association of America, a local benevolent, cultural and religious association primarily involved with local Vietnamese refugees from Camau Province in Vietnam. Thien Hau Temple has festive celebrations for the birthdays of all the deities enshrined here, the biggest for Mazu, March 23 of the lunar calendar. There is also a major festival on Chinese New Year's Eve every year. Check www.thienhautemple.com for dates. The biggest celebration in Chinatown is the Chinese New Year Parade and Festival that takes place in January or February according to the Lunar New Year. Other annual events include the Chinatown Summer Nights series of night festivals and the Autumn Moon Festival held in September or October. Check the calendar at chinatownla.com for upcoming events.